Image Size: 8 X 10 in. Once upon a time, the boundless imagination of master storyteller James C. Christensen created a series of paintings under the guise of an obscure (and fictitious) 15th century Flemish painter. This enigmatic collection became known as “Saints and Angels” for its similarities to the devotional art of that era, as well as its portrayals of largely forgotten Christian saints. Greenwich Workshop fine art collectors have contributed to the sell-out of previous limited editions from Saints and Angels including Isabella, Angel with Epaulet and Madonna with Two Angels. 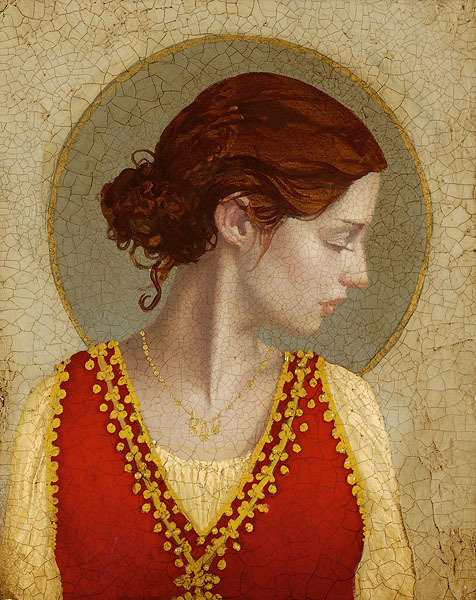 St. Apollonia is the perfect complement to any of the releases from this series of elegant yet powerful women or a lovely and affordable start to a James C. Christensen collection of art for your home. Apollonia is the patron saint of dentists and those suffering toothaches. When heathens in Alexandria revolted against the Christians in 249, Apollonia was beaten and her teeth were pulled because she would not recant her Christian beliefs. Your authorized Greenwich Workshop fine art dealer can make it possible for St. Apollonia to grace your home this holiday season and beyond.